Socks and underwear: One pair of each per day traveled. Shirts and dresses: Two less than the total trip length. Wear the same outfit on the flight there and back. Pants: A pair of jeans for every other day. These can be replaced with slacks if the occasion calls for them. Shoes: A pair of sneakers or sandals. Bring boots or formal shoes if needed. If you need to bring boots, wear them on the flight. Coats and Jackets: Wear these on your flight. If you’re going to a warm weather destination don’t even bother with them. Toiletries: Pack the essentials in a small bag. Make sure any liquids are in a TSA compliant container. Know the Weather: Take a look at the extended forecast for your destination and pack accordingly. Roll anything that you don’t mind getting wrinkled. It is far more space efficient. Folding should only be reserved for nicer clothing that you don’t want to iron later. 1. Stuff your shoes full with socks and underwear and put the shoes in first. 2. Put in your heaver rolled items like jeans and sweatshirts squeezed in as tightly as possible. 3 (optional). Put in any fragile items you have. Putting them in the middle will make sure they’re cushioned at all times. 5. On top of all of that place your nicer, folded clothing. 6. Stuff any other lightweight items into the sides. 7. Put your toiletries bag on top. You can be less precise in your packing on the return trip. I recommend investing in a compressor bag like this one for all of your dirty clothes. At this point you probably don’t really care about wrinkling your dirty clothes so just use a compressor bag to drastically reduce the space taken up by your clothing. This will allow you ample space to fit souvenirs from your trip. This doesn’t have to be you. Today many people will be flying all over the country to be with their families tomorrow on Thanksgiving and the skies will be packed with many infrequent flyers. Add to that some miserable weather in one of the busiest areas of the country and you have a flyer’s nightmare on your hands. However, many of these common flying woes are entirely predictable and with some strategic packing you can make a bad experience more tolerable. Lifehacker has a great article up listing some of the best things you should pack in your carry-on to help you combat some of the most common problems encountered during a flight. Problem: Your flight is delayed. Solution: Always bring something to entertain yourself like a book, magazine, e-reader, computer, or tablet. Problem: The plane runs out of food or drinks. Solution: Always pack an empty water bottle that you can refill after you pass through security and have a few small snacks ready. I always make sure to pack a few granola bars. Problem: Your electronics are running out of battery life and you have no place to charge them. Solution: A USB backup battery is a great thing to have handy for these situations. These batteries can give a much needed charge to anything chargeable with a USB cable which includes most of today’s smartphones and tablets. Problem: Parts of your body are starting to hurt from sitting in the plane’s torture devices economy class seats for too long. Solution: Pillows and pills. You can get some great portable pillows to support your neck in the terminal and any spare clothing you bring can make an improvised lumbar pillow. It may be wise to bring some over-the-counter painkillers like ibuprofen to help dull some of the pain you’re feeling on the flight. If your airport looks like this, chances are no one is going anywhere for a while. The cheapest days of the year to fly. Early December and late January are typically when you’ll find some of the cheapest airfares of the year. Book Presidents’ Day weekend in early December. Prices probably won’t come down much before then. Try going to a cooler big city instead of a resort. You can get some great deals in the winter by opting to go to a city like New York, Washington DC or San Francisco because there is less business travel there in the winter. Consider alternate airports. For example, Tampa and Fort Lauderdale are good substitutes for Orlando and Miami respectively in Florida. You may have a longer drive to your final destination but you’ll save a lot on airfare. Schedule connecting flights out of Southern airports. 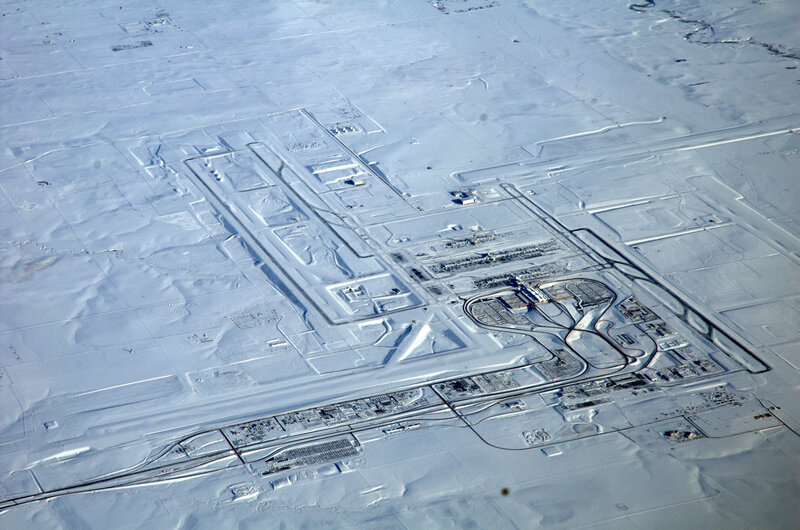 Those airports are far less likely to experience weather related problems in the winter. Fly early. Early morning flights are cheaper and have the best chance of going out on time. Be the first to find out. This increases your chances of getting an alternate flight that works for you. Flightstats.com is a good tool to use to get the most up-to-date information. Have an alternate flight in mind before contacting your airline. You don’t want to depend on just the airline to find you the flight you want. Besides, telling them the exact flight you want will insure you get it faster and save everyone a lot of time. When all else fails consider going to Vegas. If you know you’re not going to be getting to your destination for a while, Las Vegas is a pretty good place to wait it out. It has a huge airport with lots of flights, cheap hotels, and clear weather. Besides it’s better to be stuck in Las Vegas than the frozen tundra of Chicago, Detroit, or Minneapolis. You want to avoid this fate at all costs. 1. Hipmunk – Helps you find lodging accommodation as close as possible to where you will be working. 2. Mynd Calendar – Calculates travel times based on real-time traffic data and lets people know you’ll be late with one button. 3. Refresh – Pulls information on the people you will be meeting from their various social media profiles. 5. FlightTrack Pro – Shows you real-time flight information, weather conditions, and terminal maps. 6. Taxi Magic – Allows you to reserve a taxi at the airport ahead of time before you land. 7. Silvercar – Use this to rent an Audi A4 minutes after you get off the plane. 8. Urban Daddy – Offers specialized restaurant recommendations based on your situation. 9. 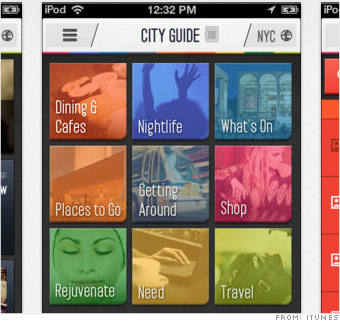 MyCityWay – The ultimate mobile guidebook for 110 cities across the country. In an announcement that all airplane passengers will love, a FAA panel endorsed the easing of restrictions on the use of personal electronics during flights even when planes are on the ground or below 10,000 feet in altitude. More specifically, they want to ease restrictions on using electronics in a way that doesn’t communicate outside the plane below 10,000 feet. So you will soon be free to use your kindle, listen to music, watch movies, and play video games at all times during your flight. You still won’t be allowed to access the internet below 10,000 feet nor will you be allowed to send or receive phone calls or text messages at any point during your flight. The FAA’s restrictions on personal electronics use originated in the 1950s when it was discovered that passengers bringing radios on their flights interfered with the navigation equipment in the cockpit. The same thing happened when the use of cell phones became widespread and using them on planes is still banned to this day. The FAA though has been gradually easing off restrictions on electronics use especially since both plane and electronics manufacturers have been designing their products so that they don’t interfere with one another. Planes today now have in-flight wi-fi while tablets and smartphones have airplane modes. In a recent stunt Amazon loaded up a passenger airliner full of kindles turned on to see if it affected the flight instruments, which it didn’t. It turns out that airlines are welcoming this news too. Part of a flight attendant’s job is enforcing the rules and the current rules about personal electronics are difficult to enforce. A rule that has very little scientific backing and is difficult to justify that is openly broken by many travelers leads to unnecessary tensions between airlines and customers that both would like to avoid. Airlines would much rather have their flight attendants spend their time enhancing the customer experience rather than confronting passengers for breaking a silly rule. Also when you have a rule about safety that is widely ignored it undermines all of the other important rules about safety. For all of these reasons the FAA panel recommended easing restrictions and everyone involved will be happy when they’re all finally gone. That is the only business I can think of that will be disappointed by this news. It appears we’re witnessing a sea change in the consumer preferences of air travelers. It has long been known that many flyers want to get the very cheapest airfare they can get their hands on and this cutthroat competition has resulted on many airlines scaling back the usual amenities. It seems like every time I get on a plane the complementary bag of pretzels or peanuts gets smaller and smaller, and the miniature bottles of liquor get more and more expensive. It seems though that many American passengers are willing to give up some of those amenities entirely in exchange for one thing, complementary in-flight high-speed wi-fi. The problem is that unlike more conventional amenities that can just be loaded onto a plane, turning an aluminum tube flying 30,000 feet above the Earth at 450 miles per hour into high-speed hotspot is incredibly difficult. Difficult yes, but not impossible. It turns out that airliners are getting the message loud and clear too. Airlines all over the world are starting to bring this capability to all of their flights thanks to satellite broadband. For example JetBlue’s most recent overhaul has resulted in having 180 planes that can provide a connection speed of 12 megabits per second which leagues ahead of the average broadband connection speed in the United States which is 8.6 megabits per second. But perhaps the most interesting part of the survey is how much passengers would be willing to sacrifice to stay connected like that. While things like meals, drinks, legroom, and reclining seats were all on the chopping block, the most interesting response was that 13 percent of American passengers would give up the right to use the plane’s bathroom in exchange for a fast connection. Now those are people who really can’t unplug. I can hold it, now let me stream Breaking Bad over the Pacific Ocean. Start your travel day well rested – Go to bed early the night before and make sure you get plenty of sleep. Without a good night’s rest any stress that your body feels is going to be magnified. Being sleep deprived will only make you more tired and more stressed. Choose your luggage carefully – Don’t bring too much with you. Carrying heavy, abnormal, and unnecessary luggage around will only put more stress on your arms and back. Packing light can also save you some money by not having to check a bag. Wear compression socks– Compression socks will improve blood flow and reduce any swelling and soreness caused from sitting for long periods of time. Eat right and drink water – Drink enough water and eat plenty of healthy food like fruits and vegetables. Try to avoid the fast food options at the airport unless you want to spend half of your flight in the airplane bathroom. Sit up – Try to align your back with the back of the seat. Slouching puts a lot of unnecessary stress on your lower back and can lead to back problems down the road. Stand up if you can – During a long flight you usually have ample opportunity to stand up an stretch your legs. Our bodies aren’t meant to remain in one static position for a long time. I try to get an aisle seat on a flight for exactly this reason. Exercise at your destination – When you make it to your destination. do some stretching and some light exercise like walking or jogging. Just moving your body will get your blood flowing better and you will likely feel better the next morning. Get another good night of sleep – This is easier said than done when you factor in jetlag but getting a good night’s sleep will relieve most of the stress your body faced from travel. With that you should be ready to do what you set out to do at your destination feeling good. I’m pretty sure economy seating violates the eighth amendment.